Sherman was born on Labor Day 2003. His pedigree on mom’s side goes back to Attla, Wright and Huntington. 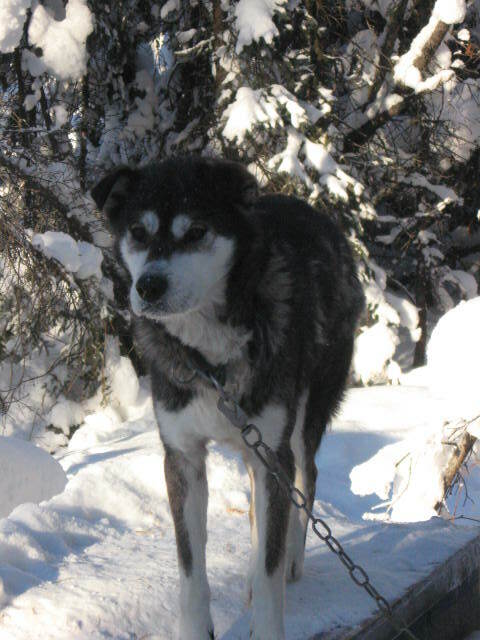 His dad was a loose village dog – big friendly husky. Sherman is a tank and that’s how he got his name. He is a gentle and tolerant dog and will run in team with male or female. His work ethic is solid and yet he will also crawl into your lap if you let him. His mom was a leader but despite numerous attempts he has never demonstrated the drive to be at the front of the team. He will give you 110% though anywhere else. Sherman would do well in a recreation setting where he will still have the chance to run but his racing days are behind him. He is fairly leggy and deep-chested and is an enthusiastic eater!! Sherman was also a glacier dog this summer so he is well muscled.